The College of Southern Maryland is one of six community colleges in the nation and one of two academic institutions in the state of Maryland to receive funding from the US Nuclear Regulatory Commission for scholarships. Fifteen students at the College of Southern Maryland who are pursuing an Energy Degree now have the opportunity to receive scholarships, funded by the US Nuclear Regulatory Commission. CSM received a $105,804 grant from the NRC, which will provide scholarships to 15 students going for the college’s Energy Systems Technology (EST) associate degree program. CSM was one of six community colleges in the country and one of two academic institutions in the state of Maryland to receive funding from the NRC. “These scholarships provide a great way to get an education in the engineering technology field through our award-winning, hands-on program,” said Bernice Brezina, CSM Business, Technology and Public Service Division chair and professor. Professor Brezina also said that while the nuclear industry is unique to Southern Maryland’s economy and work force needs because of Exelon Generation’s Calvert Cliffs Nuclear Power Plant in Lusby, there is a demand also to fill jobs nationally in the nuclear industry, making these 15 scholarships even more valuable. According to the Nuclear Energy Institute, nearly 23,000 jobs will be added to the nuclear field in the next five years. Also, nuclear worker salaries are 36 percent higher than the average local salary. Since the program was created, Exelon has hired 21 students from the EST program. Those 21 CSM alumni have gone on to build careers with Exelon in the fields of electrical, instrument, and control and mechanical maintenance, plus support of nuclear operations. CCNPP leadership also hosts a 10-week summer program to allow CSM student interns to rotate through numerous departments at the two-unit plant as part of the EST curriculum. 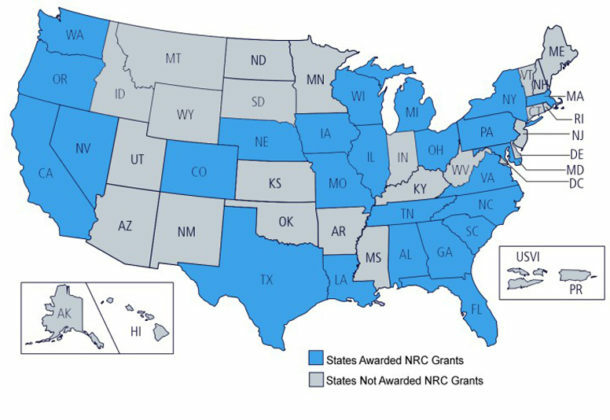 This is the 10th year that CSM and Exelon – a Fortune 100 energy company doing business in 48 states, DC, and Canada – have worked together to provide the EST program and seek NRC grants that support scholarships. The program started when NEI asked nuclear power companies to find a community college partner that could develop a curriculum for training nuclear technicians because of an “inadequate pipeline of workers and the graying of the ‘baby boomers,” according to the grant request submission. Then owner of the CCNPP – Constellation Energy Nuclear Group – offered CSM more than $300,000 in equipment and scholarships to get the program started at the college’s Prince Frederick Campus. CSM EST Assistant Professor and Program Coordinator Armando Hernandez is also the senior lead mechanical maintenance technical instructor at Calvert Cliffs. He said that, over the years, the EST program has evolved to continuously meet the industry’s highest standards, but the program now also incorporates technologies like hydro, solar, wind, geothermal, and fossil fuels. To apply for the scholarships, incoming CSM students have to qualify with a minimum 3.0 GPA in math and science, (maintain a 2.5 GPA once enrolled at CSM), must be a full-time CSM student, US citizen, and serve six months in nuclear-related employment if offered at the time of graduation. The scholarship covers the cost of tuition, books, supplies, and dedicated tutoring. For more information about the EST program, visit CSM online. For more about the NRC-specific scholarship, or any scholarship at CSM, visit the college’s Scholarship Finder.